L-R Matthew Burke, STR; Adele Labine-Romain, Deloitte Access Economics; Dr Adele Lausberg, TAA NSW Acting CEO and Greg Clark, Hostplus at the TAA Hotel Outlook Forum yesterday. Growth in the number of domestic overnight trips being taken by Australians has surpassed the number of international overnights recorded, Tourism Accommodation Australia has revealed. According to the Deloitte Access Economics ‘Tourism and Hotel Market Outlook’ report for 2019, data shows that for the first time in many years, regional Australian hotels find themselves in a highly advantageous position with strong levels of domestic tourism likely to lead to stronger occupancy rates. The data continues to show that domestic tourism continues to grow and has been doing so for the past eight years. 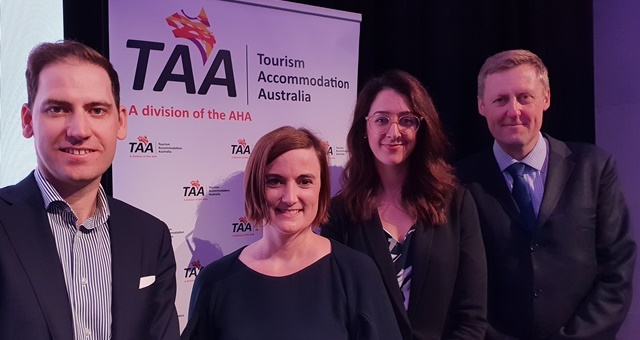 The report was unveiled yesterday at the first half-yearly TAA Hotel Outlook Forum for 2019, hosted by the Four Seasons Sydney. Sydney and Melbourne continue to compete for market share, delegates were told, with the Victorians gaining the edge with an 11 per cent rise in overnight trips and 13.9 per cent increase in new hotel rooms coming online. Despite the swing in favour of Melbourne, Sydney was fighting back with a glut of new room supply coming online – the highest recorded in four years. Both cities were expected to weather slight setbacks in overall occupancy as a result, however both are expected to recover as numbers climb back to current levels over the next three years. Brisbane was suffering a slight lag at present owing to strong investment in new rooms in recent times, with the city now working to stimulate sustainable demand to drive up average occupancy levels. According to STR, around 50,000 new rooms are in Australia’s national pipeline, with over 17,500 currently under active construction. Of this, more than 7,000 are planned to rate in the luxury market segment. Sydney Airport and Western Sydney were seeing the collective lion’s share of new rooms coming online, the hotel industry data giant said. “What is clear from these presentations is that our sector is doing well, despite global pressures and a changing landscape,” said TAA NSW Acting CEO, Dr Adele Lausberg. TAA National and the NSW branch will soon welcome its new CEO, Michael Johnson.